This culminated in the decision to sack manager Roberto Martinez, replacing him with former Dutch international Ronald Koeman, who was tempted to leave Southampton for the project at Everton. This was a clear statement of intent by new majority owner, Farhad Moshiri, an Iranian billionaire, who bought a 49.9% stake in the club for a reported £85 million in February 2016 after selling his Arsenal shareholding to business partner Alisher Usmanov. The club also brought in a new director of football in the shape of Steve Walsh, who had been responsible for some astute player recruitment at surprise champions Leicester City by scouting the likes of Riyad Mahrez, N’Golo Kanté and Jamie Vardy. 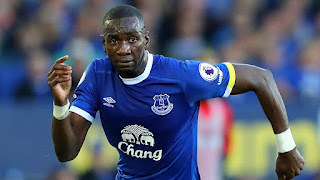 "Rom, if you want to"
Before his departure, the ebullient Martinez said, “financially we can compete against anyone in world football”, which seemed a bit over-the-top, but for the first time in ages Everton do appear to have a solid plan. As part of the new strategy, Moshiri will clearly make funds available to strengthen the squad, which will give the Blues a fighting chance on the pitch. 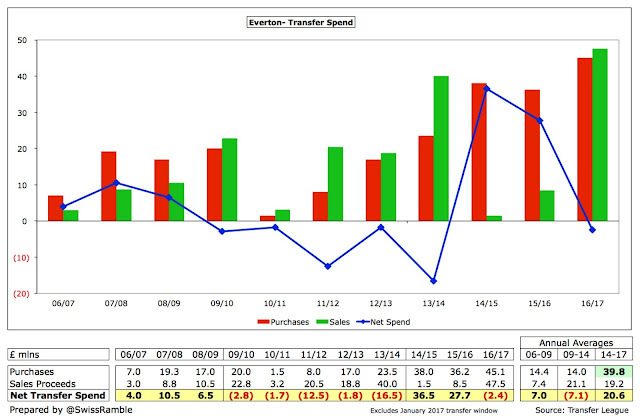 The need for new investment was highlighted by the publication of Everton’s financial results for the 2015/16 season, which included a hefty loss of £24.3 million, considerably higher than the previous season’s £4.6 million, though the bottom line was adversely impacted by a significant £11.3 million exceptional payment “to former employees and other costs in relation to the change in coaching staff in the year”. This obviously included paying out the remainder of Martinez’s contract. 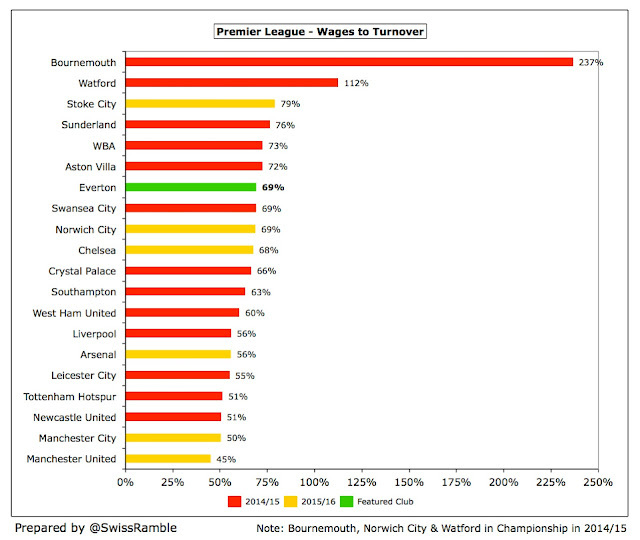 It is not clear whether the reported £5 million compensation paid to Southampton to secure Koeman’s services is also included, but my guess would be that will only be reflected in next year’s figures, given that the Dutchman signed his Everton contract on 14 June, i.e. after the 2015/16 accounts were closed. 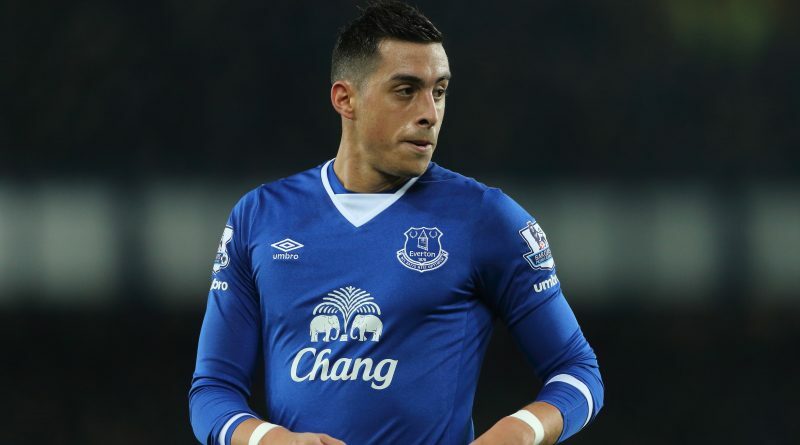 Furthermore, Martinez’s pay-off was reported in the media to be in the region of £10-12 million. "Have I told you, Leighton?" 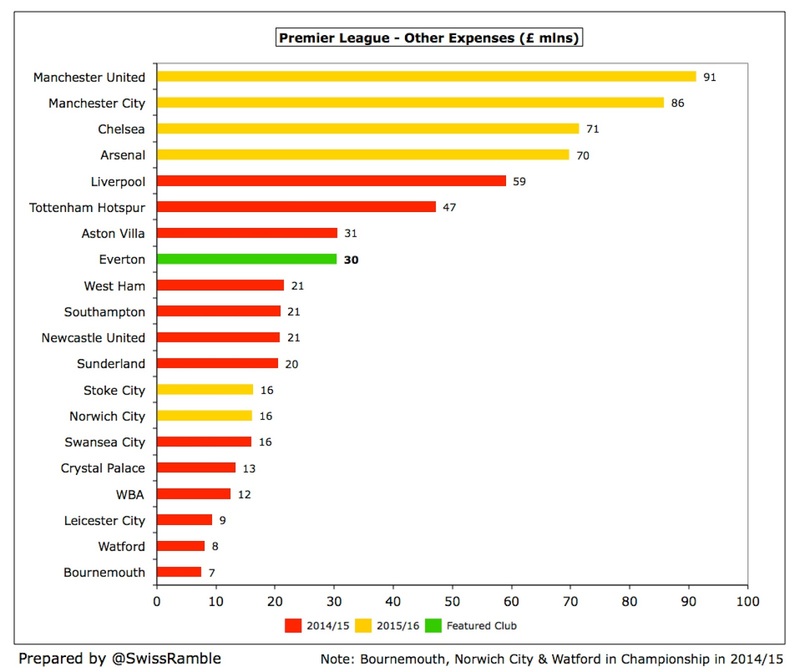 The absence of European football also meant that gate receipts were £0.3 million (2%) lower, though this was largely offset by reaching the semi-finals of the FA Cup and Capital One Cup. 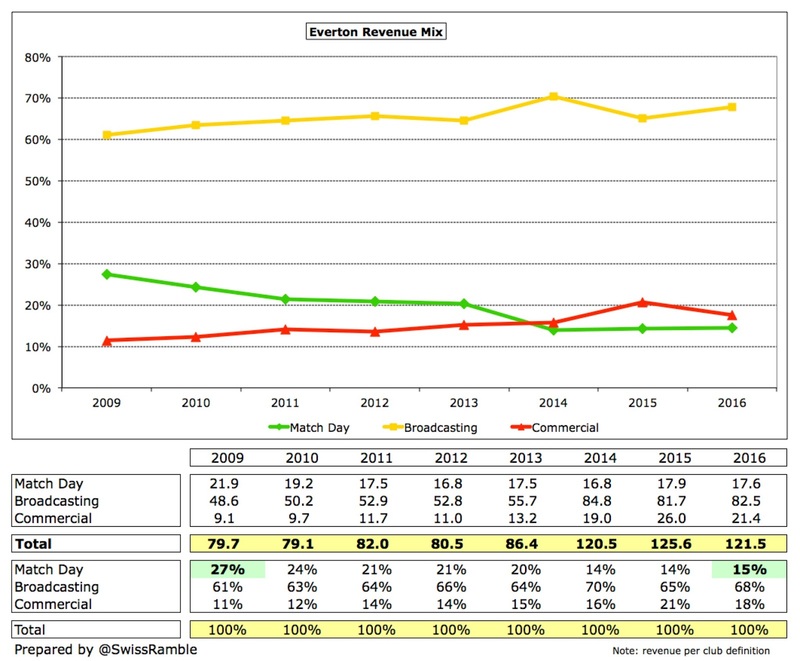 Broadcasting income was slightly higher at £82.5 million, due to Everton being shown live one more time. Costs continued to grow with the wage bill rising £6.5 million (8%) to £84 million and player amortisation up £3.3 million (17%) to £22.4 million. Other expenses also increased by £1.5 million to £30.4 million. In contrast, profit on player sales rose £4.5 million to £7.8 million, while net interest payable was £2.7 million lower at £3.7 million. It should be noted that the 2014/15 interest was restated following the transition to Financial Reporting Standard 102. 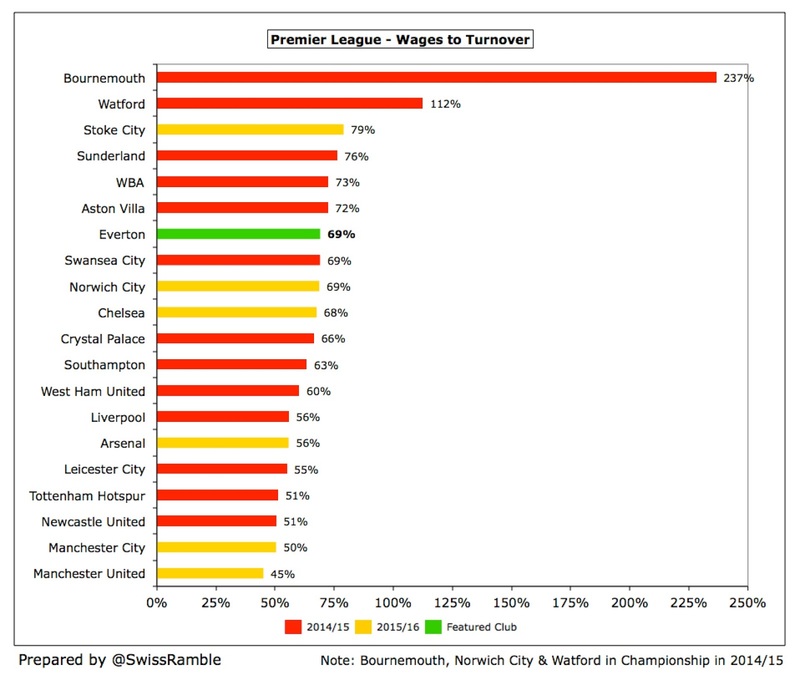 Traditionally, football clubs have lost money, but the environment has largely changed in the Premier League these days, thanks to the combination of surging TV money and Financial Fair Play regulations, which has meant that top-flight English clubs have never been richer. 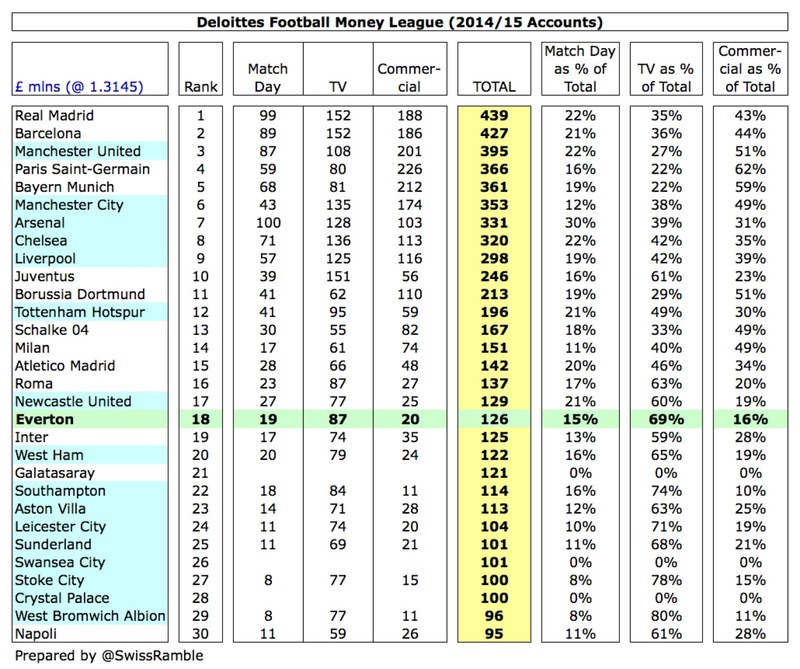 In fact, Everton are one of only two clubs that have so far published 2015/16 accounts that have reported a loss. The other one is Chelsea, and they would also have been profitable without £75 million of exceptional payments (mainly the termination fee for their shirt sponsorship deal). At the other end of the spectrum, we find the two Manchester clubs with United and City announcing healthy pre-tax profits of £49 million and £20 million respectively. The other Premier League clubs that have released 2015/16 accounts to date were also profitable: Norwich City £13 million, Arsenal £3 million and Stoke City £2 million. This continues the trend of the 2014/15 season, when only six of the 20 Premier League clubs made losses. This group largely comprised clubs that have been badly run (Aston Villa, Sunderland and QPR), but also included Chelsea, Manchester United and, yes, Everton. 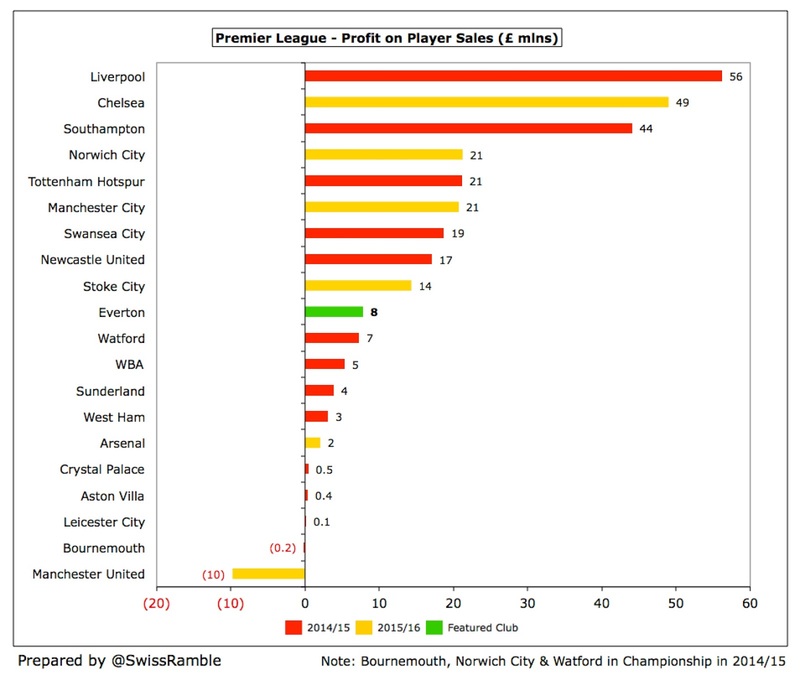 In fairness, one of the drivers for Everton’s poor financial performance has been the lack of profits from player sales. 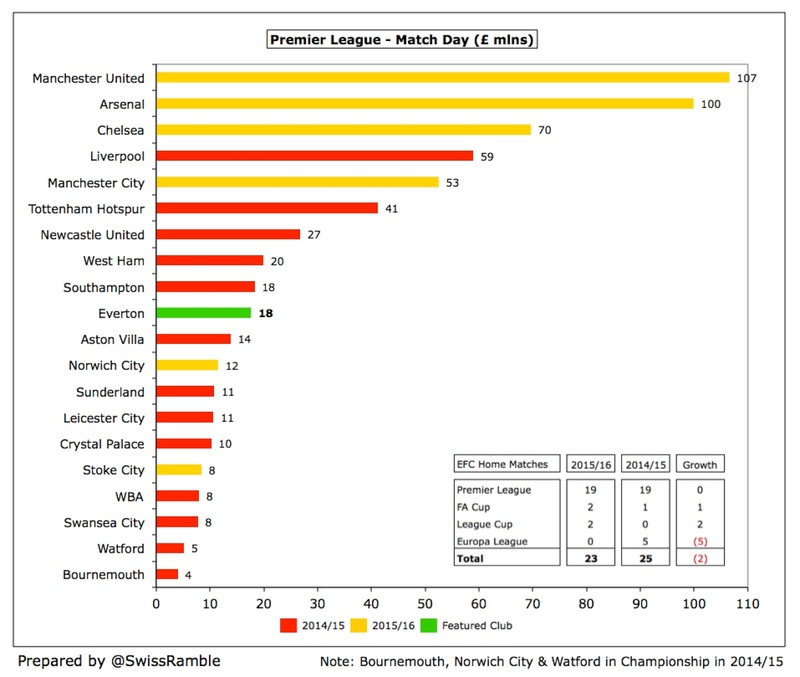 This activity can have a major influence on a football club’s bottom line, as shown in 2014/15 by Liverpool (£56 million) and in 2015/16 by Chelsea (£49 million). 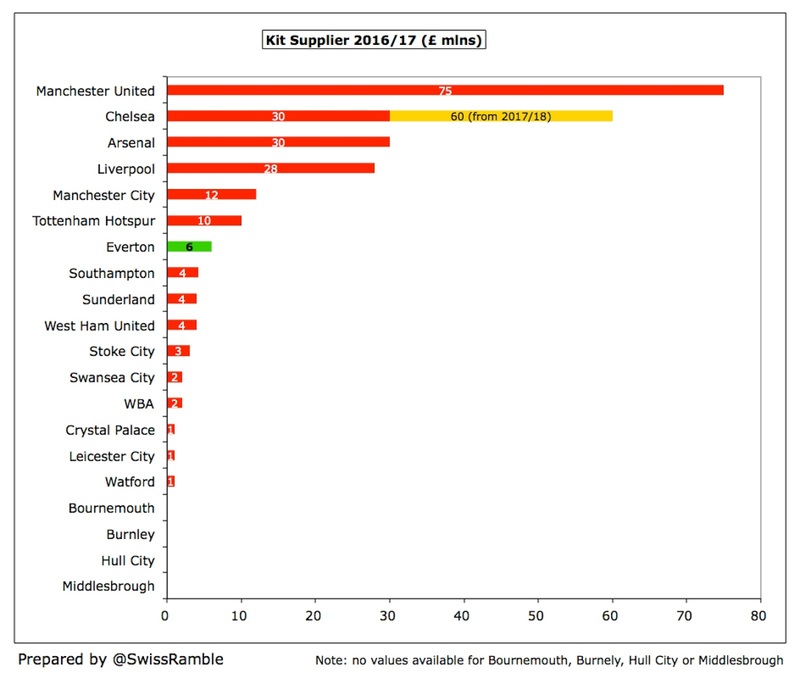 In contrast, Everton only generated £8 million of profit from this activity, mainly due to the transfer of Steven Naismith To Norwich City, though this was higher than the £3 million reported in 2014/15. 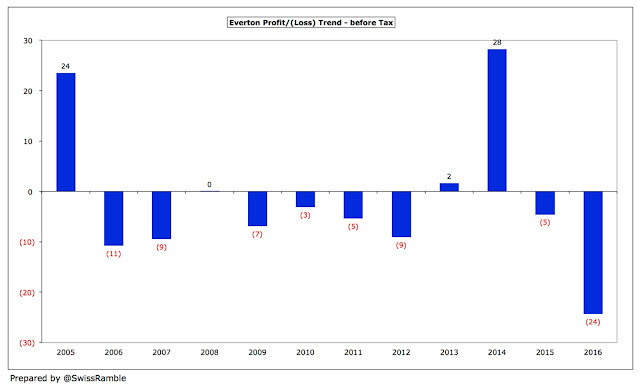 Of course, Everton have more often than not lost money, reporting losses in eight of the last 11 years. They were consistently loss-making between 2006 and 2012 (with a cumulative £45 million loss in those seven years), though they did at least restrict their annual losses to manageable levels. There was then some improvement in 2013 and 2014 before a return to losses in 2015 and 2016. 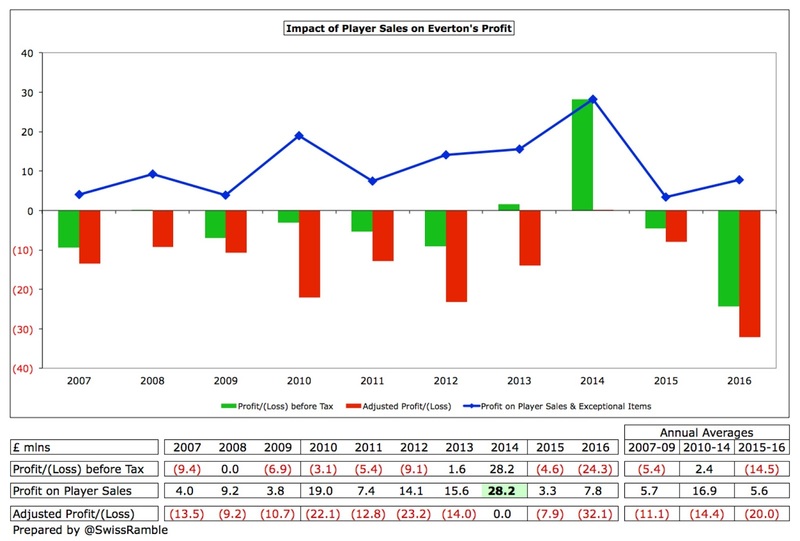 Over the last decade, Everton’s aggregate loss before tax was £33 million, but this would have been significantly worse without £113 million of profits from player sales in the same period. Next year’s accounts will benefit from the £47.5 million sale of defender John Stones to Manchester City, which will help Everton swing back into the black (along with the additional money from the new TV deal). 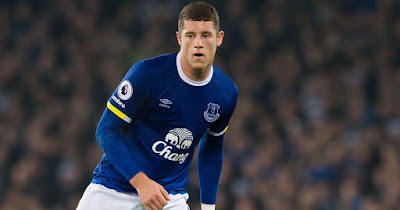 The club has noted that the balance sheet “substantially undervalues” players such as Romelu Lukaku and Ross Barkley, especially as no cost is ascribed to home grown players. 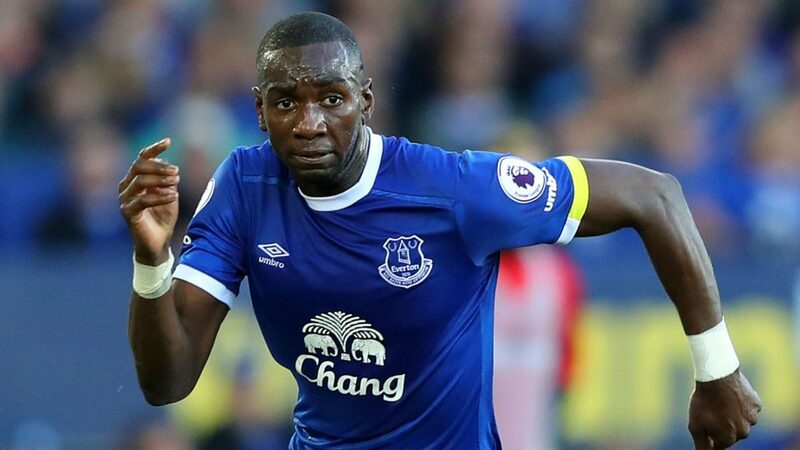 Of course, Everton would almost certainly want to retain such talent, but they would boost their profits if they were to sell. 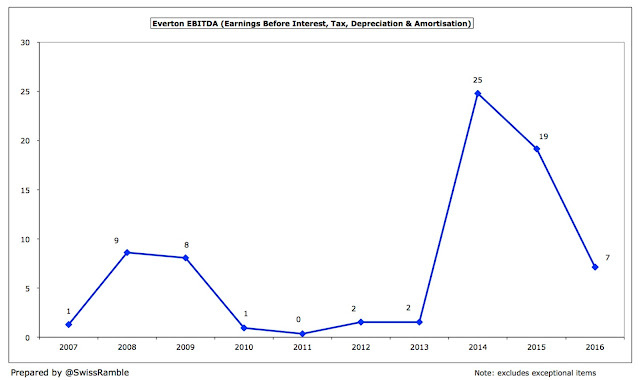 To get an idea of underlying profitability and how much cash is generated, football clubs often look at EBITDA (Earnings Before Interest, Depreciation and Amortisation), as this metric strips out player trading and non-cash items. 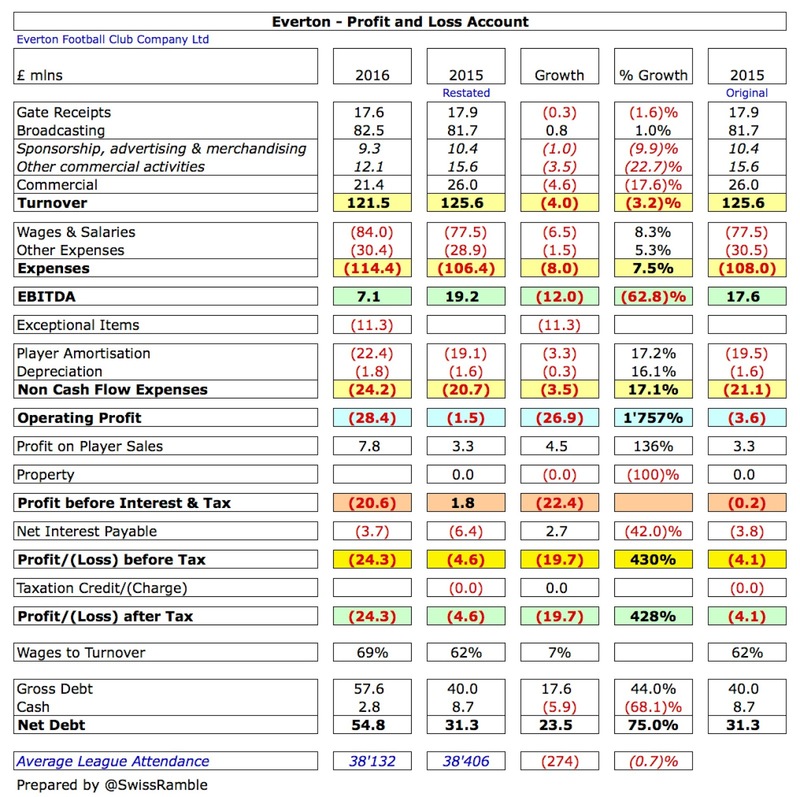 In Everton’s case this highlights their operational difficulties in the past two seasons, as their EBITDA has fallen from £25 million in 2013/14 to just £7 million in 2015/16 (excluding exceptional payments). 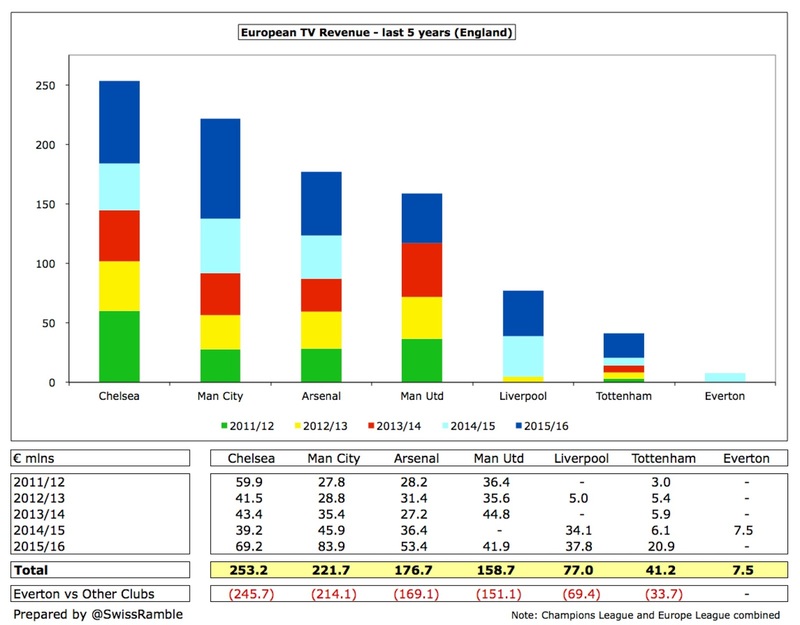 The major improvement in 2014, following many seasons of cash break-even, was largely due to the first year of that Premier League TV deal three-year cycle, so we could anticipate a similar jump in 2016/17 with the new TV deal – at least £9 million based on the operating profit projection at Everton’s AGM. 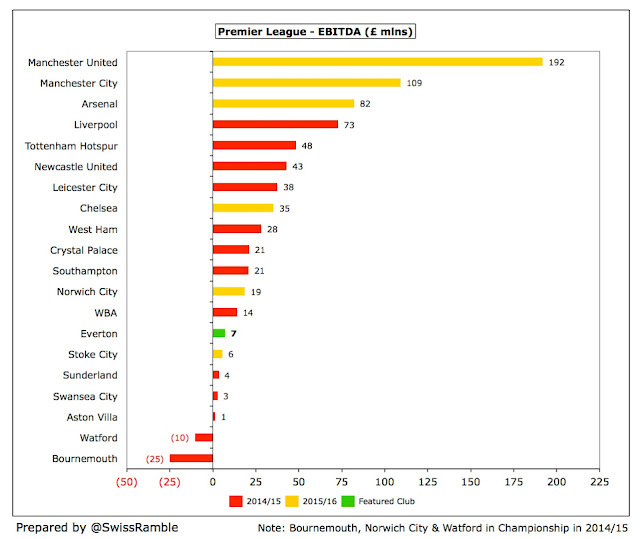 This is much-needed if we look at EBITDA in the Premier League, which shows that Everton are a long way behind the elite with Manchester United leading the way with an astonishing £192 million, followed by Manchester City £109 million and Arsenal £82 million. In other words, United’s cash profit is an incredible 27 times as much as Everton’s. The only Premier League clubs with lower EBITDA than Everton were Stoke City, Sunderland, Swansea City and Aston Villa, which is a shocking state of affairs for a club of Everton’s history. No wonder that Moshiri has been welcomed with open arms, as he will definitely grow the club’s revenue. 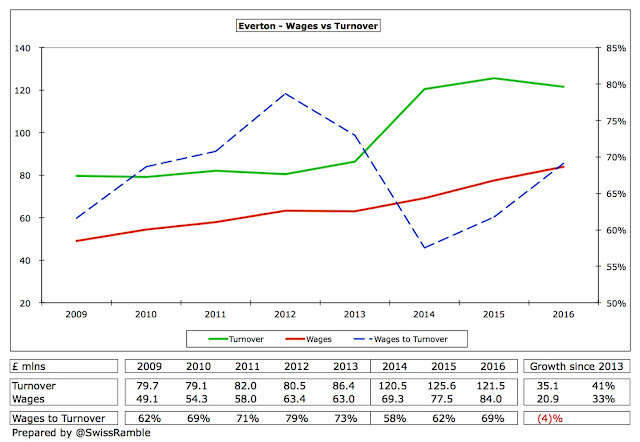 Everton made great play of the fact that 2015/16 was the “third successive year we posted turnover in excess of £120 million.” That’s one way of looking at it, but another less charitable view would be that revenue has essentially been flat for the last three seasons. 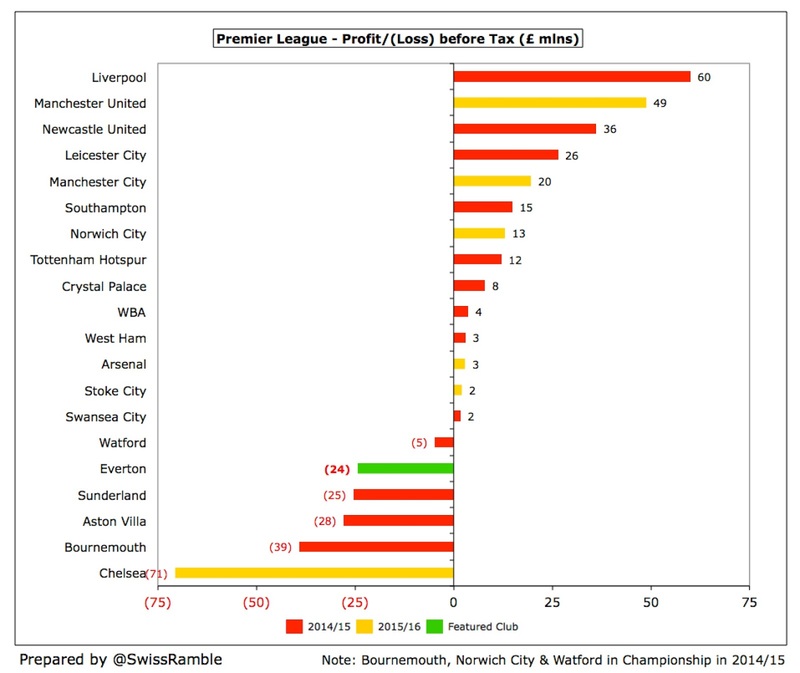 Since 2013 revenue has grown by £35 million (41%), though most of this is down to the increasing TV deal (£27 million), which is thanks to the central Premier League negotiating team, as opposed to the club’s board. In fairness, commercial revenue has grown by £8 million in this period, while gate receipts were unchanged at just under £18 million (though this is a bit misleading, as it does not take into consideration the club’s restatement of the revenue categories in 2014). At the recent AGM Everton projected revenue of £172.5 million in 2016/17, a year-on-year increase of £51 million, almost all of which is driven by the new Premier League broadcast deal. The club’s challenge has been to differentiate itself from other clubs by growing commercial income. Although they have been unsuccessful in the past, Moshiri will surely change that for the better. 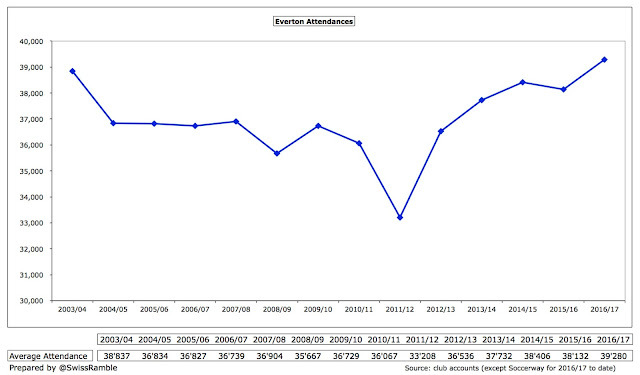 The importance of revenue growth is clear when we compare Everton’s £122 million to the Premier League elite, e.g. Manchester United earned more than half a billion, which is almost £400 million higher than the Blues. That’s an enormous financial advantage – every season. 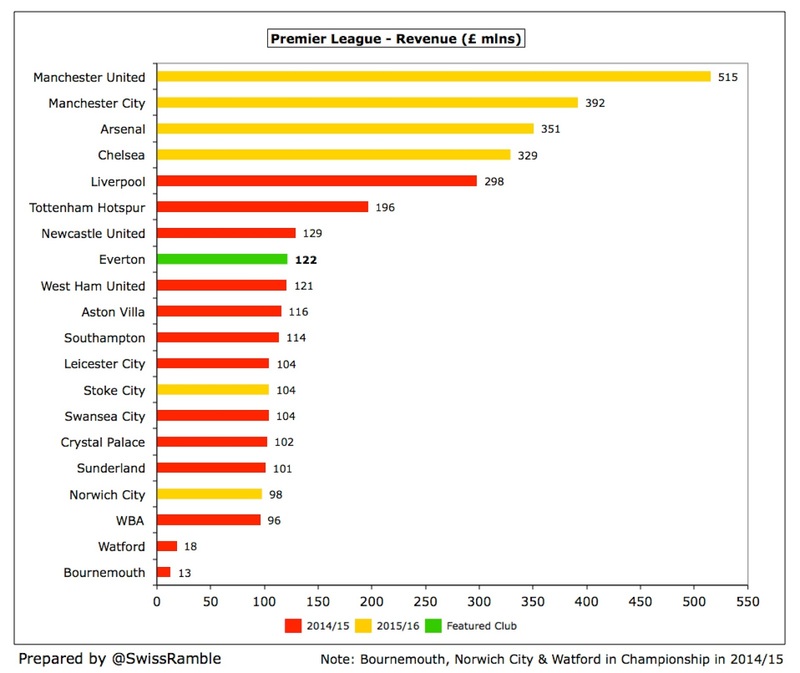 Although it could be argued that Everton are not doing too badly in revenue terms, as they are the 8th highest in the Premier League, there is a distinct bunching of clubs in the £100-120 million range. In other words, Everton’s financial advantage over the other clubs is nowhere near as much as their disadvantage compared to the top six. One point worth noting is that Everton’s revenue would be around £8 million higher if the gross revenue from the outsourced catering and kit deals were to be added back. 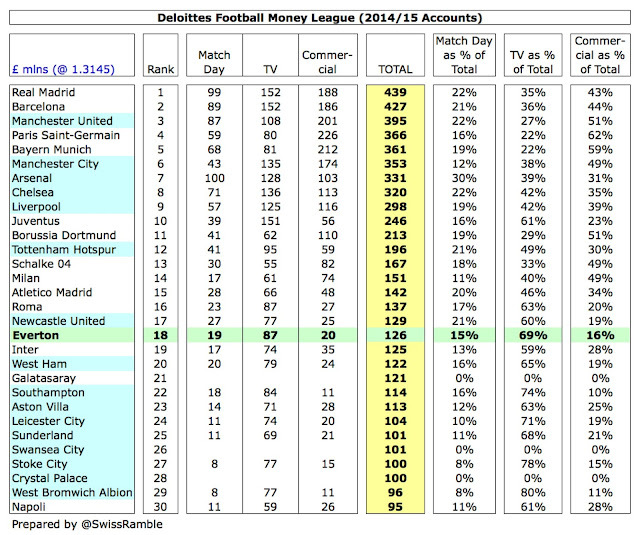 On the bright side, Everton had the 18th highest revenue in the world in 2014/15, which represented the club’s joint highest position in the Deloitte Money League. 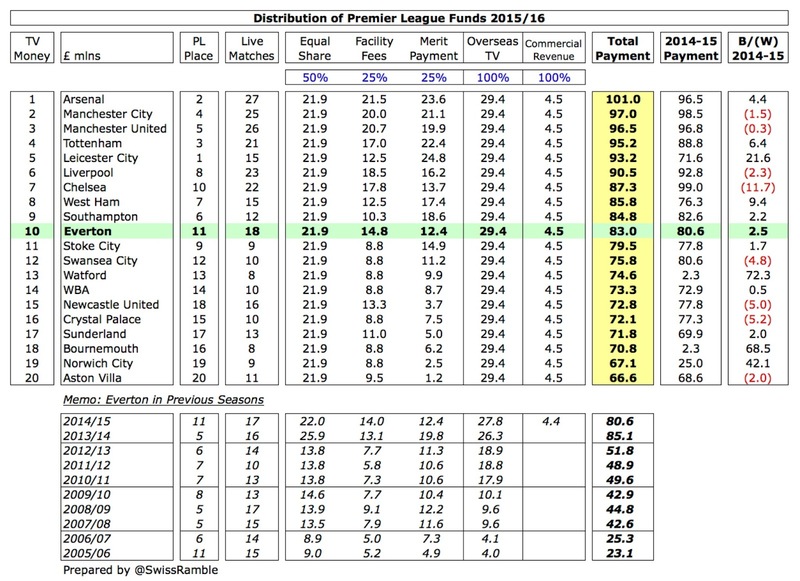 That’s obviously a fine accomplishment, but it does not really help Everton much domestically, as no fewer than 17 Premier League clubs feature in the top 30 clubs worldwide by revenue. One technical aside: Everton include the commercial elements of TV deals within commercial income, even though most other clubs classify it as broadcasting income, and Deloitte have duly reduced commercial and increased broadcasting (though the total revenue is the same). All these reclassifications make it difficult to analyse Everton’s revenue mix, but a couple of things are clear. 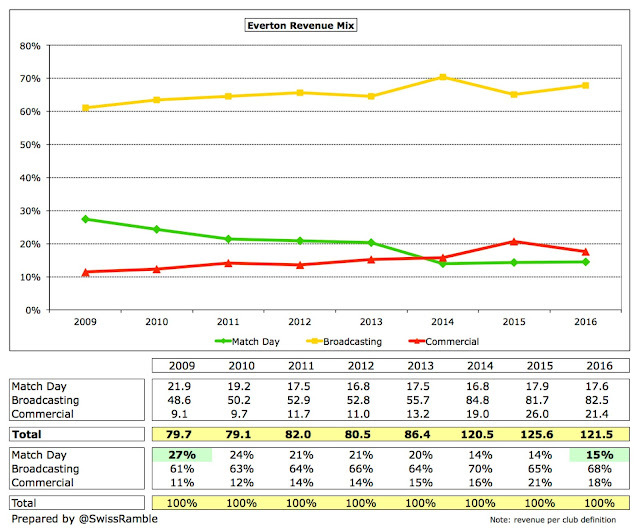 First, match day has become progressively less important with only 15% of total revenue coming from this stream. 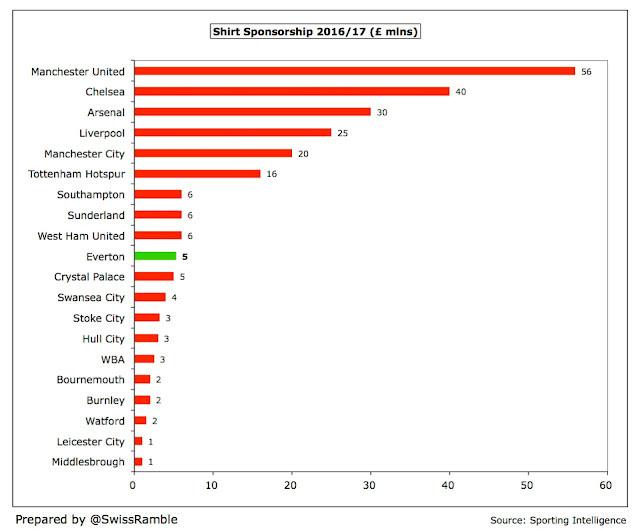 Second, like so many Premier League clubs, there is huge reliance on TV money, which generates just under 70% of their turnover. 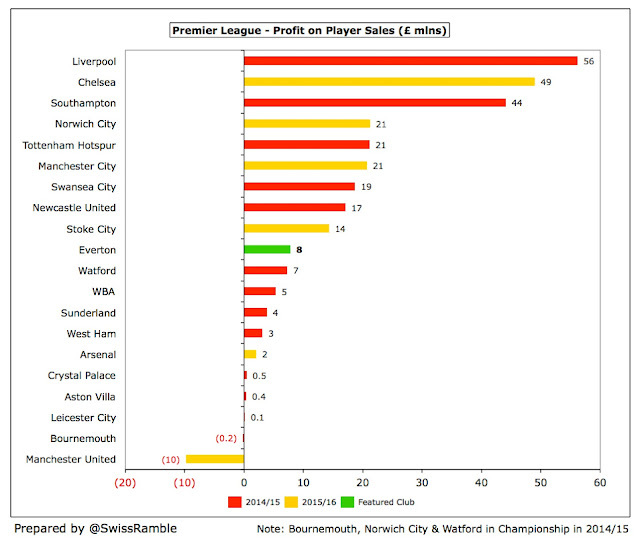 That might sound a little concerning, but it is fairly common business model in the Premier League. 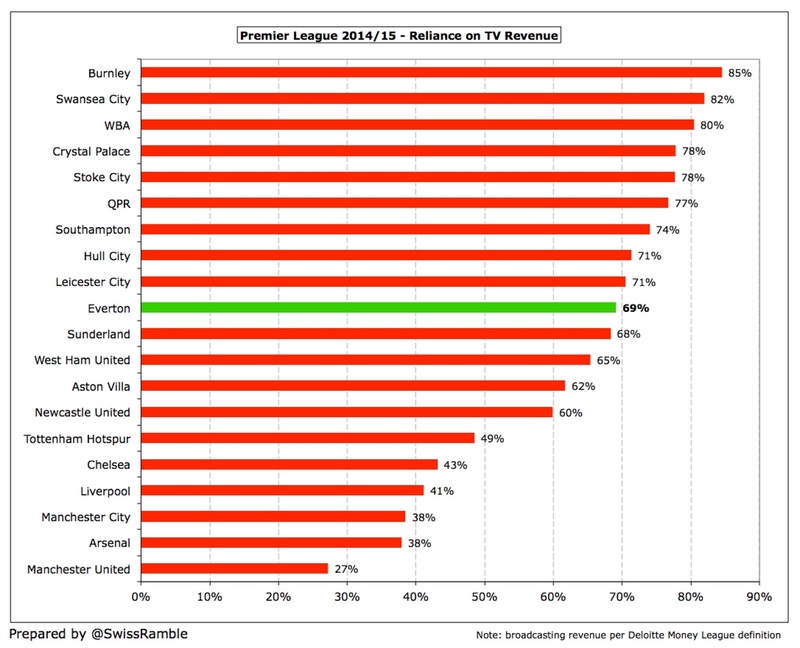 For example, in 2014/15 nine clubs actually had a greater reliance on TV money than Everton, with three of them (Burnley, Swansea City and WBA) earning 80-85% from broadcasting. 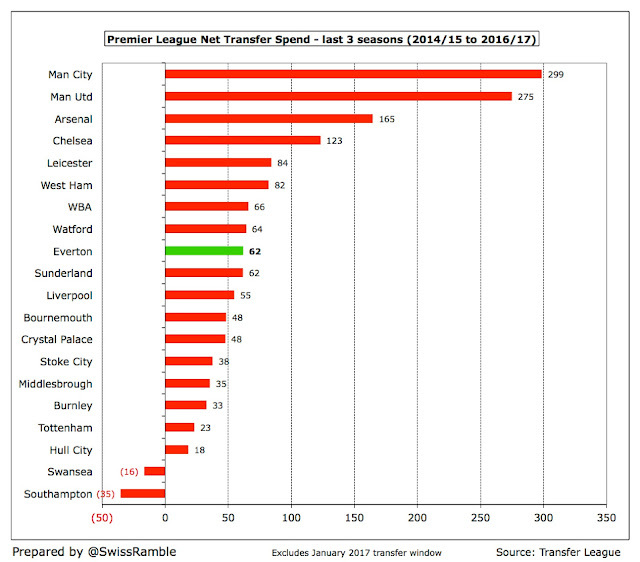 This dependency will further increase with the blockbuster 2016/17 deal. In 2015/16 Everton’s share of the Premier League TV money rose 3% (£2 million) from £81 million to £83 million, due to being broadcast live on one more occasion (18 vs. 17). 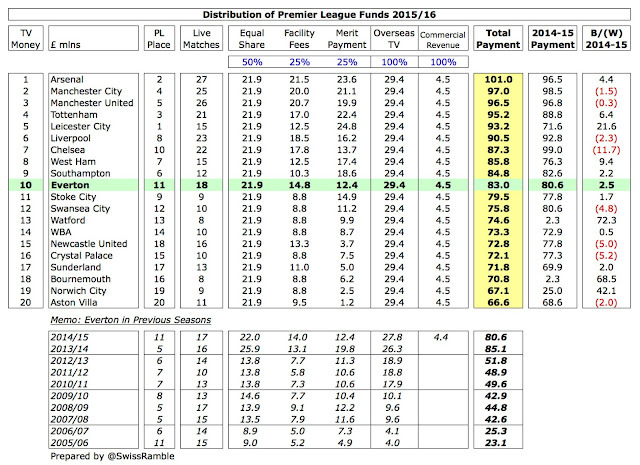 The distribution of these funds is based on a fairly equitable methodology with the top club (Arsenal) receiving £101 million, while the bottom club (Aston Villa) got £67 million. Most of the money is allocated equally to each club, which means 50% of the domestic rights (£21.9 million in 2015/16) and 100% of the overseas rights (£29.4 million). 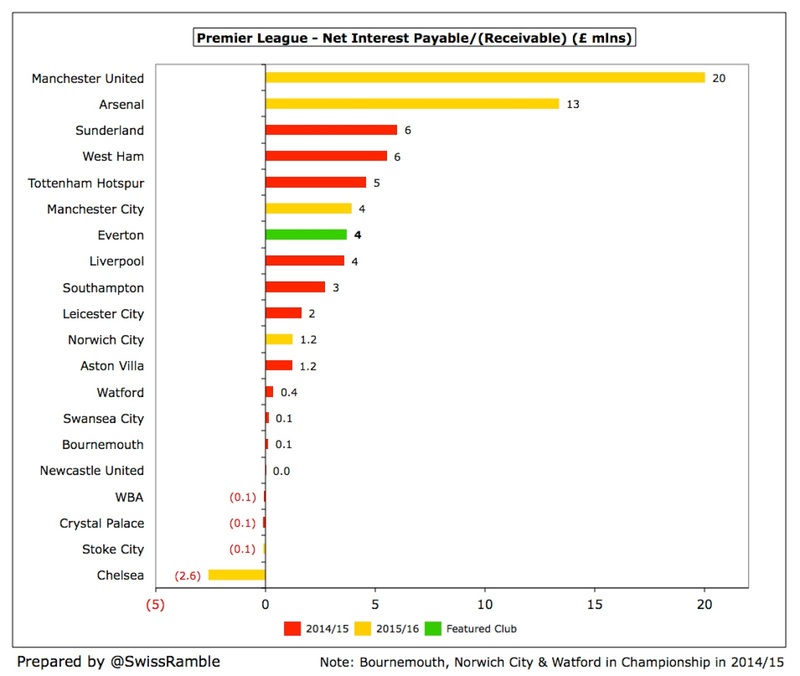 Merit payments (25% of domestic rights) are worth £1.2 million per place in the league table and facility fees (25% of domestic rights) depend on how many times each club is broadcast live. There was also £4.5 million of commercial revenue awarded to all Premier League clubs, though I suspect that Everton might have reported this within commercial income, even though most other clubs classify it as broadcasting income. This would help explain why Everton’s total broadcasting income in the accounts was only £82.5 million, even though their Premier League distribution was £83.0 million. 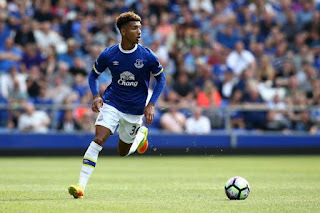 "The Liberty of Mason Holgate"
Either way, Elstone was right to draw attention to the new TV deal stating in 2016/17: “We are also benefiting from the increased revenues under the significant new broadcast deal” The AGM projected an increase in broadcasting income to more than £130 million, based on 55% growth in the Premier League deal (70% domestic and 40% overseas). The importance of success on the pitch was also emphasised, as each league place under the new deal would be worth an additional £1.9 million, compared to £1.2 million for the previous deal. 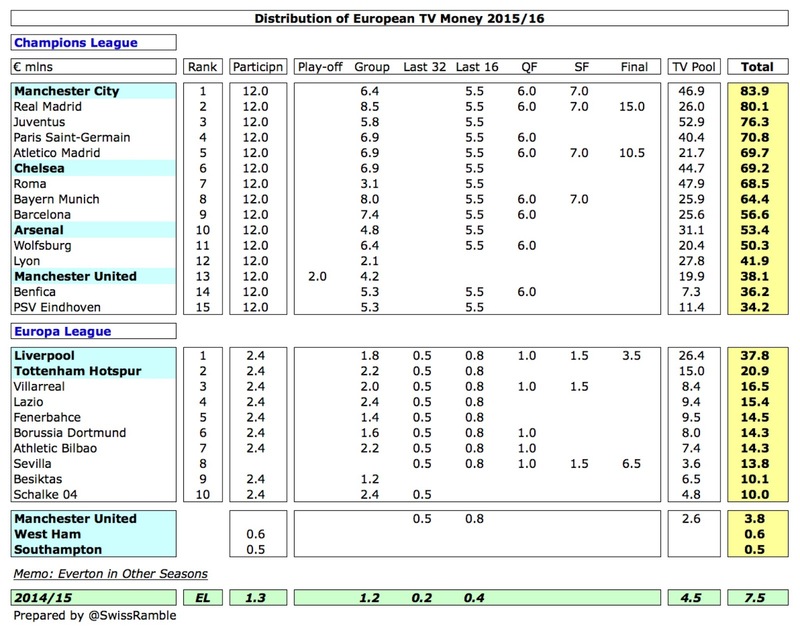 Another way of looking at this is that Everton earned more from broadcasting in 2014/15 than Bayern Munich, Borussia Dortmund, Atletico Madrid, Roma, Milan and Paris Saint-Germain – even before the £45-50 million increase in 2016/17. Everton have only qualified once for Europe in recent years, earning €7.5 million from the Europa League in 2014/15. 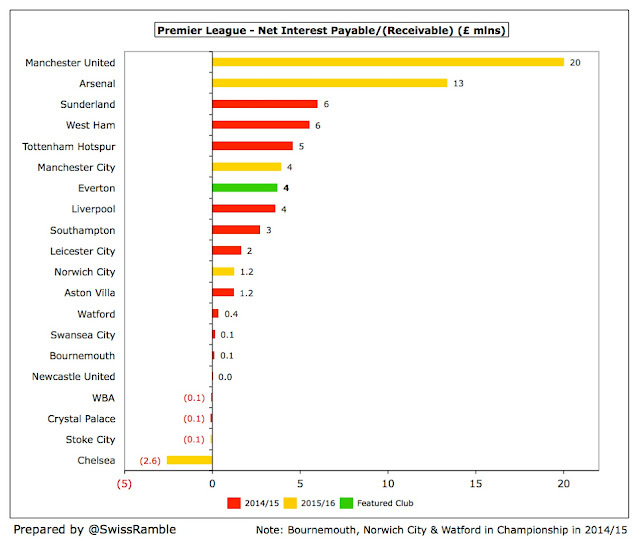 This was a lot less than the €20.9 million that Tottenham received for reaching the same stage the following season. 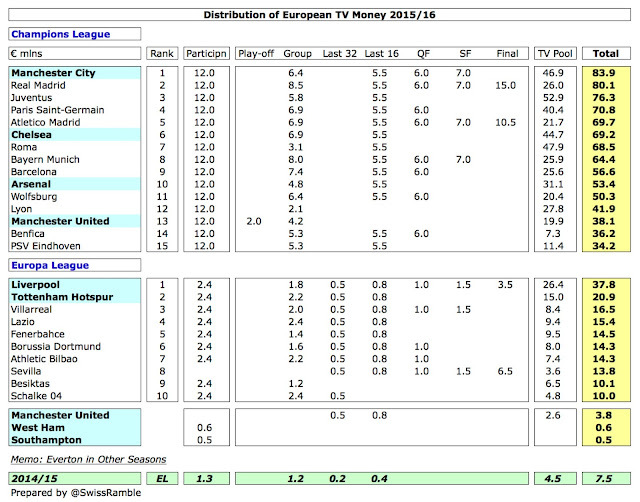 Not only did the new UEFA television deal deliver 38% more money in 2015/16, but a greater proportion was allocated to the Europa League, so that prize money for this competition shot up by 71% (even though the rewards are still much higher in the Champions League). Regular qualification for Europe would be highly beneficial for Everton, as can be seen by the money earned by English clubs over the last season. 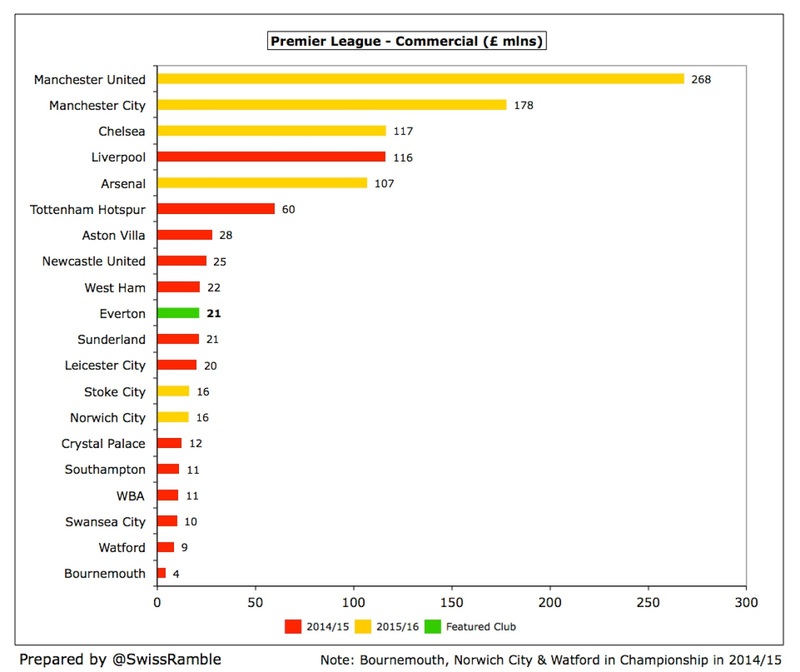 Chelsea lead the way with €253 million, largely thanks to their Champions League triumph in 2012, but maybe a better comparative would be Liverpool, who earned €77 million in this period, i.e. €69 million more than Everton. This only relates to the broadcasting income, but additional revenue would also come from more gate receipts and higher commercial income via success clauses in commercial deals. 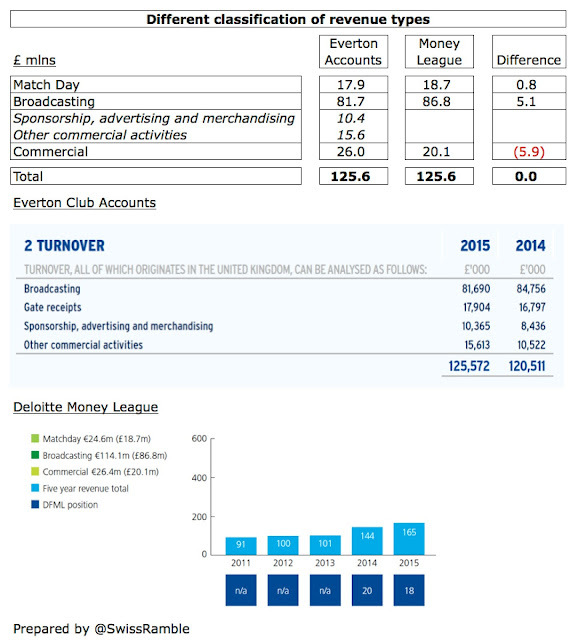 Everton’s gate receipts fell by £0.3 million (2%) from £17.9 million to £17.6 million in 2015/16, largely due to the absence of European competition, though the impact of this lost revenue was reduced by increased revenue form reaching the semi-final of both domestic cup competitions compared to third round exits in 2014/15. The average attendance fell slightly to 38,132, though this was only the second time in 20 years that consecutive seasons posted averages above 38,000. 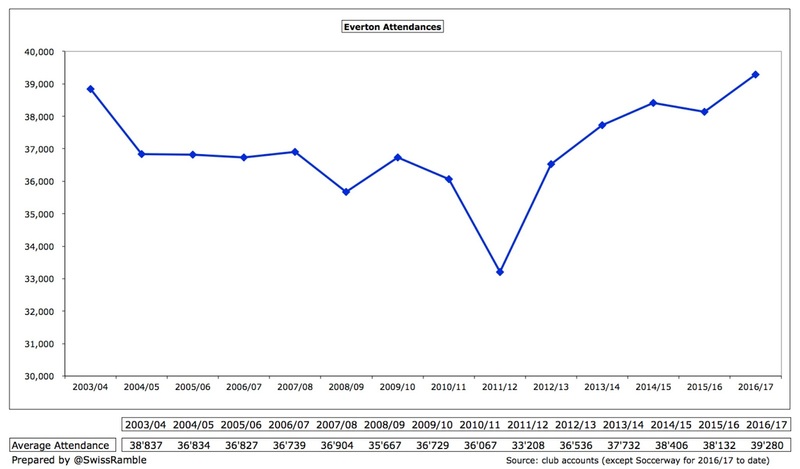 Moreover, this season attendances have rebounded above 39,000, which would be the highest attendance since 2003/04. This is partly due to Everton’s admirable commitment to affordable pricing. The club froze ticket prices in 2015/16, while they actually reduced all season ticket prices by 5% for the 2016/17 season, representing a free game compared to the previous season. They have continued this trend by announcing that all season ticket prices will be reduced or frozen for the 2017/18 season and have introduced a 12-month payment option. The maximum season ticket price is £565, ensuring that no adult will pay more than £30 a game. There is also a new £380 season ticket for 22-24 year olds, so youngsters will only pay £20 a game. As a result of these pricing initiatives, Everton’s match day revenue of £18 million will continue to lag behind the top six clubs: Manchester United £107 million, Arsenal £100 million, Chelsea £70 million, Liverpool £59 million, Manchester City £53 million and Tottenham £41 million. 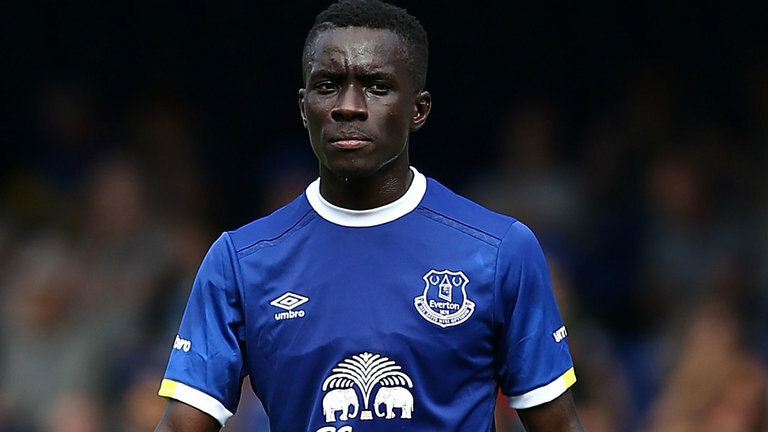 "Working for the Yannick Dollar"
Of course, a new stadium would be a game changer for Everton. It would be a wrench to leave Goodison Park, one of the most atmospheric grounds in England, but it is simply not fit-for-purpose in the modern era with its limited capacity and inadequate facilities. There have been a few false dawns with three other proposed stadium moves coming to nothing: first King’s Dock in 2003, then “Destination Kirkby” in 2009, most recently Walton Hall. However, it now feels like it could really happen. Everton’s reported commercial income dropped 18% (£4.6 million) from £26.0 million to £21.4 million in 2015/16, comprising £9.3 million for sponsorship, advertising and merchandising plus £12.1 million for other commercial activities. The fall was due to the absence of commercial revenue from the Europa League. As we saw earlier, it is not completely clear what the club has included within commercial income and the Deloitte like-for-like figure for 2014/15 was adjusted downwards to £20.1 million, as they excluded the “commercial” element of broadcasting income. This meant that Everton had the lowest commercial revenue of any club in the Money League Top 20. That said, the comparisons are a bit misleading, as Everton have outsourced their catering and kit deals. If they were to report these revenues gross (like most other clubs), their commercial income would rise by £8 million. Whatever it consists of, Everton’s commercial income of £21 million pales into insignificance compared to heavyweights such as Manchester United, who generate an amazing £268 million from this activity. That comparison might be a little unfair, but it is worth noting that Tottenham earned £60 million (in the 2014/15 season). It is therefore very encouraging (“great news” per Elstone) that the club has “signed up £75 million in new revenues” in the past few weeks. The chief executive noted that the two deals already finalised will run over a five-year period, implying £15 million a year. Elstone spoke of “a 300% increase in the value of our shirt sponsors”, which would suggest that the new deal would be worth £21.2 million a year, given that the current deal with Thai beer producer Chang is worth £5.3 million a year (£16 million over three years). That would represent a notable increase, but there have been some suggestions that Elstone’s comments could have been misconstrued, e.g. if the 300% increase referred to the total value of the deal, that would imply £64 million over five years, meaning an annual value of £12.8 million. My guess is that the increase refers to the combined value of the front of shirt and additional sleeve sponsorship, but we should soon know. Either way, it’s solid progress on the commercial front with talk of Kenyan online sports betting firm SportPesa being the new shirt sponsor. One possibility for a more lucrative deal would be to give the new partner first refusal on stadium naming rights. 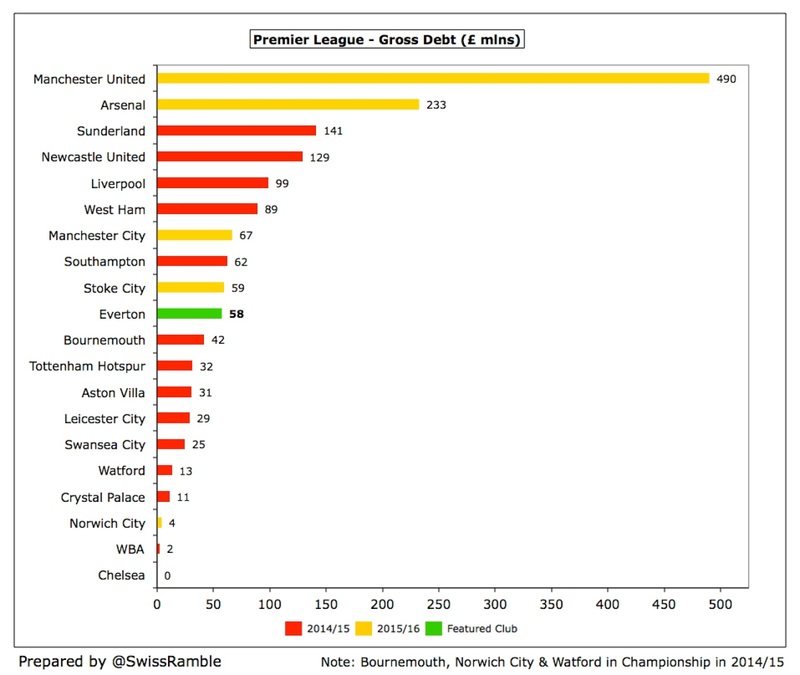 Encouraging stuff, but to place this into perspective, the leading clubs have secured much higher shirt deals: Manchester United (Chevrolet) £56 million, Chelsea (Yokahama) £40 million, Arsenal (Emirates) £30 million, Liverpool (Standard Chartered) £25 million. The club has also announced a significant new sponsorship deal for the Finch Farm training ground and academy. This is with USM Holdings, the holding company of Alisher Usmanov, Moshiri’s business partner. The fact that Usmanov is helping out his mate has raised some eyebrows, as the Russian remains an Arsenal shareholder, and it is likely that the deal would be reviewed for “fair value” by UEFA (assuming it is deemed a “related party” transaction) if Everton qualify for Europe. Everton’s kit supplier deal with Umbro was described as a club record and is reportedly worth £6 million a season, which would be twice as much as the previous Nike contract, though the accounts suggest that it might not be so high in reality. This is again a long way behind the deals at other clubs, e.g. Manchester United (Adidas) £75 million, Chelsea (Nike) £60 million, Arsenal (Puma) £30 million, Liverpool (New Balance) £28 million. It will also be interesting to see if Moshiri reviews the 10-year Kitbag deal, which provides a guaranteed £3 million a year plus royalties for running the retail operation. Elstone has described this as a good arrangement that “de-risks Everton in a notoriously difficult business sector”, but it does betray a lack of ambition. Everton’s wage bill rose 8% (£6.5 million) to £84 million, following continued investment in the squad, with the additions of Tom Cleverley, Aaron Lennon, Ramiro Funes Mori, Gerard Deulofeu and Mason Holgate. In addition, new contracts were awarded to James McCarthy, Kevin Mirallas, Mo Besic, Brendan Galloway and Bryan Oviedo. Furthermore, the average number of employees increased from 274 to 315, including playing, training and management up from 98 to 108, youth academy up from 38 to 47, marketing and media up from 32 to 41 and management and administration up from 71 to 81. The wage growth increased the wages to turnover ratio from 62% to 69%. 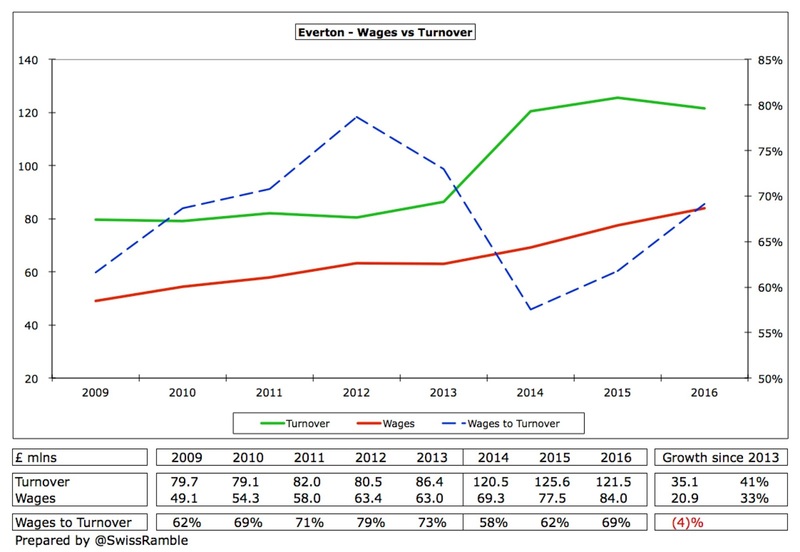 Elstone said that this was still “below the Premier League average”, which does not seem to be the case based on reported figures, though it is accurate if we add back the outsourced commercial revenue, which reduces Everton’s ratio to 65%. Following last season’s growth Everton’s wage bill is essentially “best of the rest”, i.e. the highest of those clubs outside the top six. However, it is still dwarfed by the elite clubs: Manchester United £232 million, Chelsea £222 million, Manchester City £198 million and Arsenal £195 million. 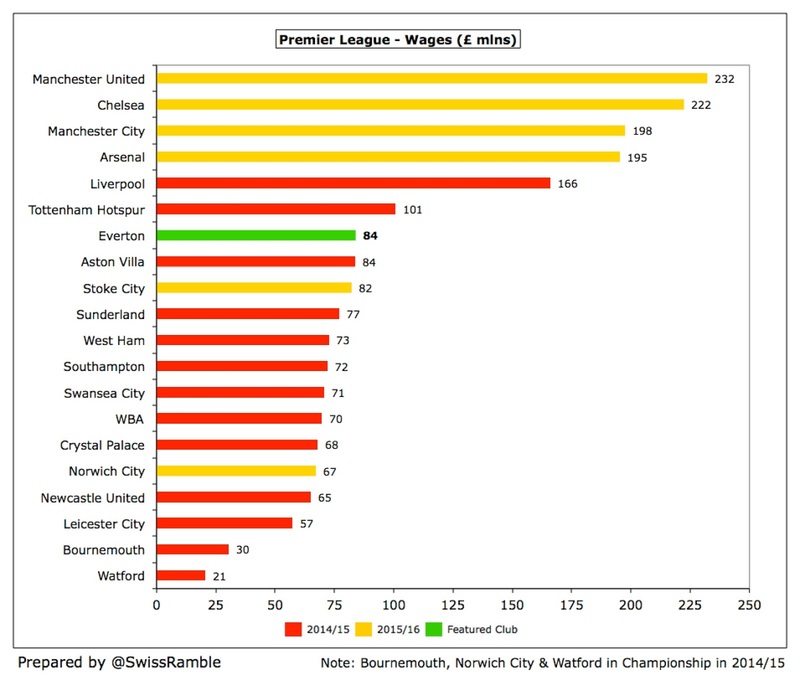 Clearly, Moshiri will try to increase the wage bill to better compete. Indeed, Elstone has already advised, “Projected wages are set to increase significantly in the current season, reflecting a further commitment to player recruitment and new contracts for existing players.” The AGM forecast a wage bill of £111 million for 2016/17, an increase of £27 million. However, Everton will need to consider the Premier League’s Short Term Cost controls, which restrict the annual player wage cost increases to £7 million a year for the three years up to 2018/19 – except if funded by increases in revenue from sources other than Premier League broadcasting contracts, e.g. 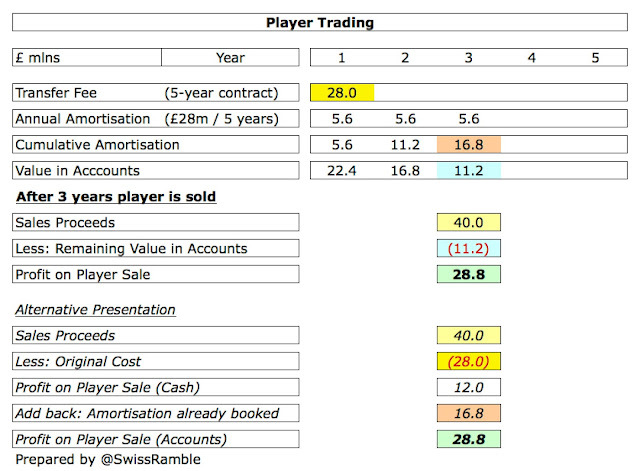 gate receipts, commercial income and profits on player sales. 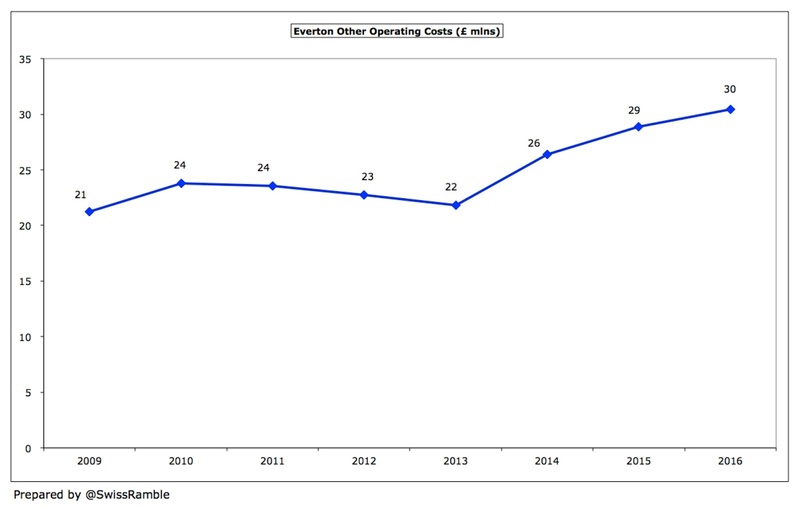 One thing that is quite striking in Everton’s accounts is the growth in other operating costs, rising from £22 million to £30 million in the last three years without any substantial explanation. 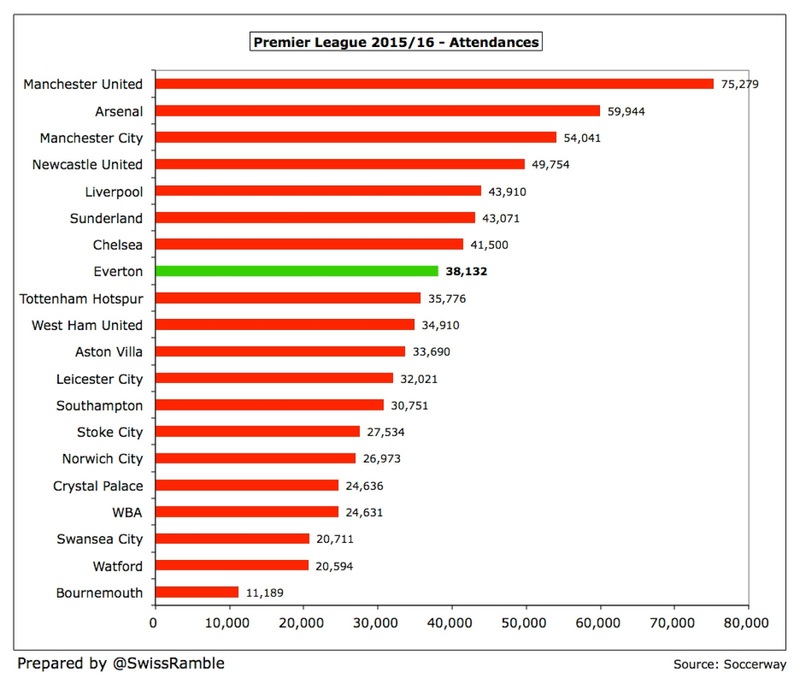 This seems quite high for a club of Everton’s size, especially as the retail and catering businesses have been outsourced, which means that other operating costs should be lower than other clubs (as net profits are reported in revenue). Another cost that can have a major impact on the profit and loss account is player amortisation, which reflects investment in transfers. 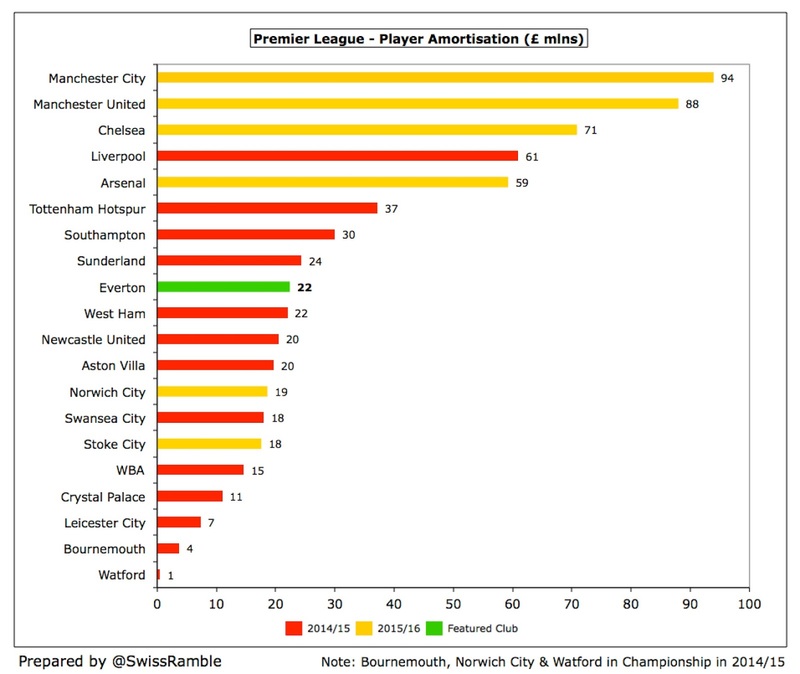 Basically the more that a club spends, the higher its player amortisation. 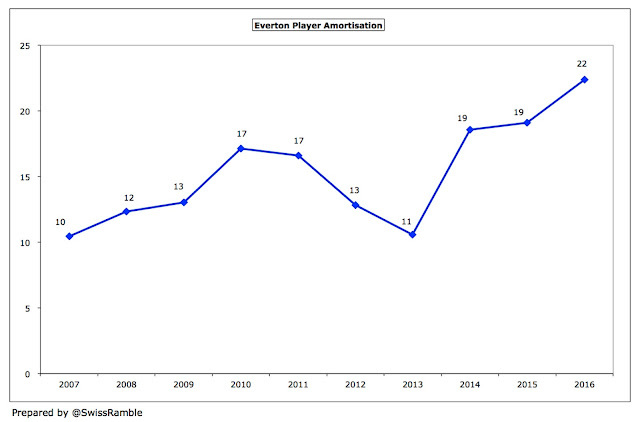 In this way, Everton’s player amortisation has doubled from just £11 million in 2013 to a £22 million peak in 2016, reflecting increased spending in the transfer market. 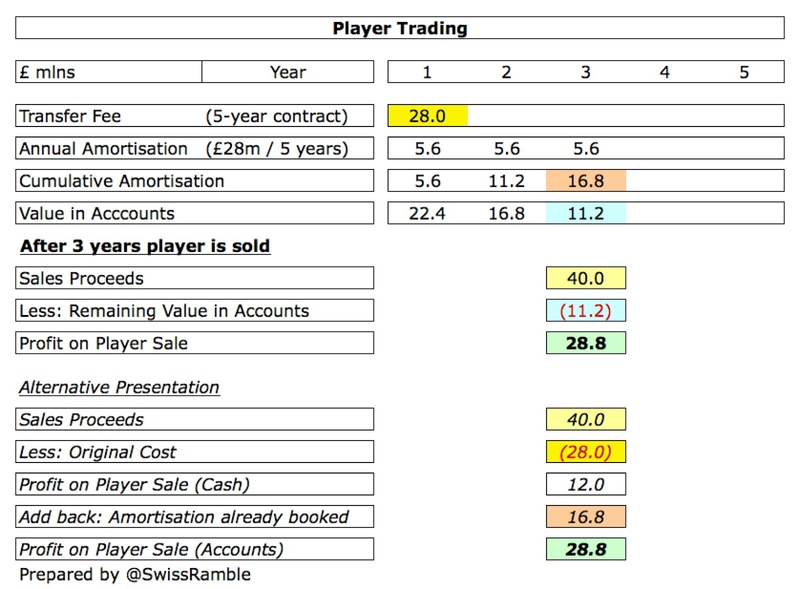 The accounting for player trading is fairly technical, but it is important to grasp how it works to really understand a football club’s accounts. The fundamental point is that when a club purchases a player the transfer fee is not fully expensed in the year of purchase, but the cost is written-off evenly over the length of the player’s contract, e.g. 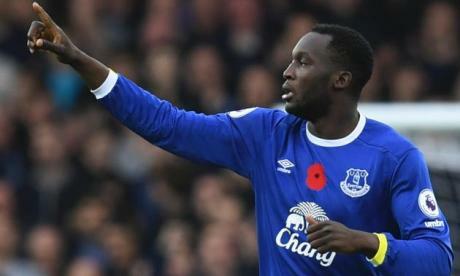 Romelu Lukaku was bought for a reported £28 million on a five-year deal, so the annual amortisation in the accounts for him is £5.6 million. 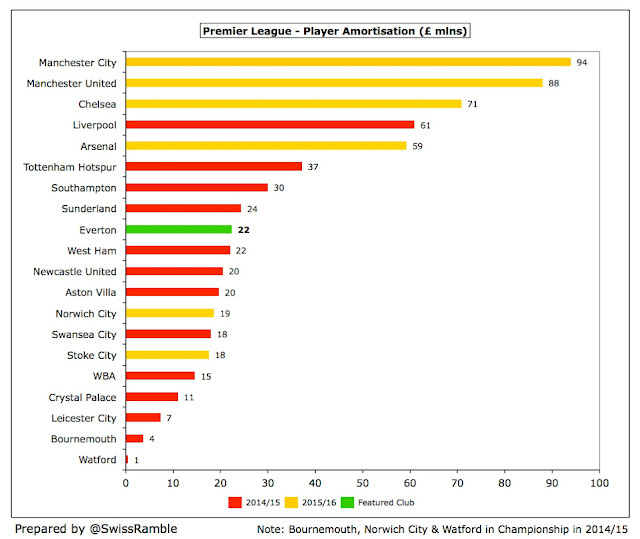 Nevertheless, Everton’s player amortisation of £22 million is not that high for the Premier League and is obviously miles behind the really big spenders like Manchester City (£94 million), Manchester United (£88 million) and Chelsea (£71 million), though it should further increase next year following this summer’s acquisitions. 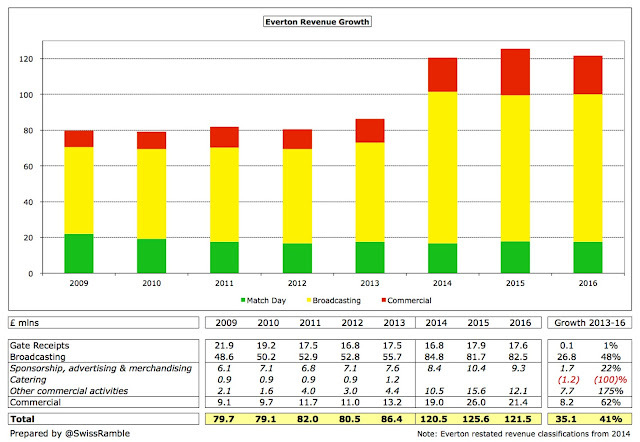 For the period between 2009 and 2014, despite Kenwright’s protestations, Everton were a selling club, averaging annual net sales of £7 million. However, the last three seasons have seen a return to spending, with average net spend of £21 million, including the club’s record purchase of Lukaku from Chelsea. Despite the higher spending over the last three seasons, Everton’s net spend is still mid-table in the Premier League, a long way below the two Manchester clubs (City £299 million and United £275 million), though it was higher than Liverpool £55 million. 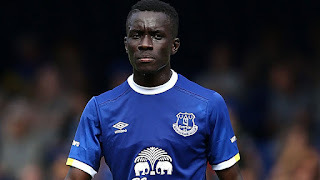 However, Everton have been one of the most active clubs in the January transfer window, already purchasing midfielder Morgan Schneiderlin from Manchester United for a fee rising to £24 million and 19-year-old forward Ademola Lookman from Charlton for £11 million. They have also reportedly made offers for Standard Liege forward Ishak Belfodil and Atalanta midfielder Franck Kessié. Everton’s net debt rose by £23.5 million from £31.3 million to £54.8 million with gross debt increasing by £17.6 million from £40.0 million to £57.6 million and cash falling by £5.9 million from £8.7 million to £2.8 million. 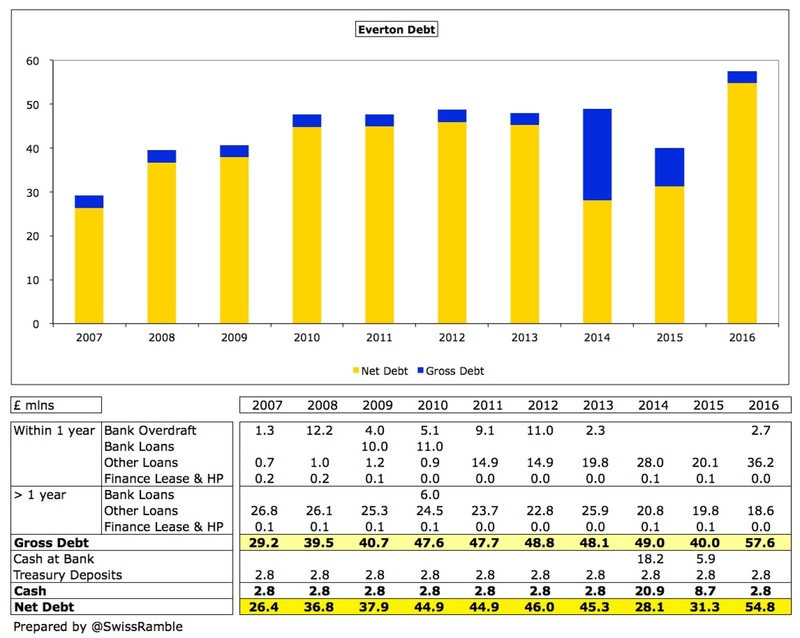 At the time of the accounts, the debt comprised three elements: (a) 25-year loan of £20 million with Prudential, which bears a high interest rate of 7.79%, leading to annual payments of £2.8 million; (b) a short-term loan of £35 million with Rights and Media Funds Limited (formerly JG Funding), securitised on Premier League TV money, at a 5.2% interest rate; (c) overdraft with Barclays of £2.7 million. This is all irrelevant now, as Moshiri provided an interest-free loan of £80 million with no agreed repayment data after the account were published. This was used to repay all of the external loans and to pay the exceptional items. Hopefully, this will bring to an end Everton’s use of opaque loans taken out with mysterious offshore corporations that started with Vibrac, who are based in the British Virgin Islands, though the accounts did note that the club had secured similar funding via a facility repayable on 14 July 2017. Everton’s debt is by no means one of the highest in the Premier League with four clubs having debt above £100 million, namely Manchester United £490 million, Arsenal £233 million, Sunderland £141 million and Newcastle United £129 million. 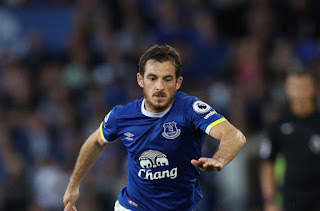 Everton also have contingent liabilities of £35 million (£18 million dependent on future appearances and £17 million loyalty bonuses if certain players are still with the club on specific dates), up from £20 million the previous season. 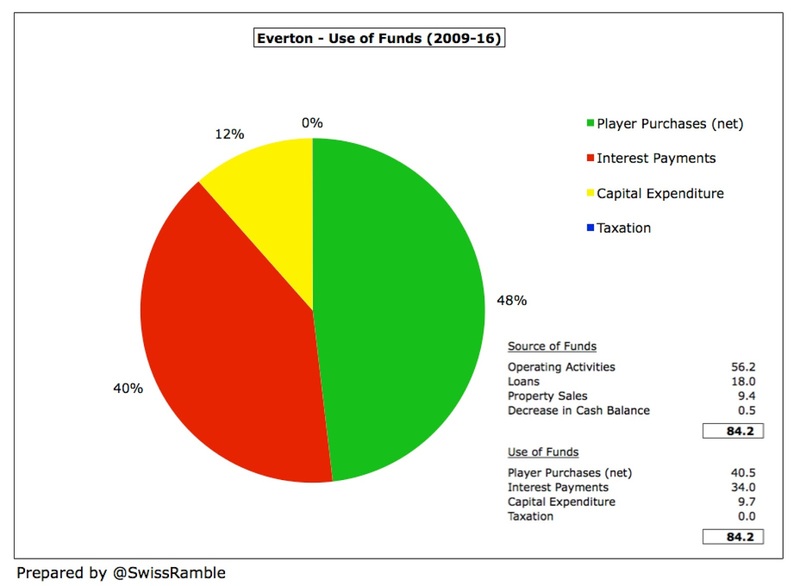 The high interest rate on Everton’s loans has meant that their financing costs have been among the largest in the Premier League. Although nowhere near as much as the interest paid by the likes of Manchester United and Arsenal, this has certainly not helped the club’s finances. The good news is that Moshiri’s interest-free loan should save them around £5 million a season. This unwelcome burden is emphasised even more when reviewing the cash flow over the last eight years. In that period, Everton generated £84 million of cash, mainly from operating activities £56 million, though this was supplemented by additional loans (net) £18 million and the sale of the old training ground £9 million. Around 40% of this cash (£34 million) was required for interest payments, which was only £7 million lower than the £41 million (net) spent on players, leaving only £10 million on infrastructure investment. Looking ahead, there is a sense of optimism around Everton’s future following Moshiri’s investment. Obviously money is no guarantee of success, but it does make it more likely. There are still some issues with Moshiri pointing out that the club will be somewhat restricted by FFP: “It is not the same as when Chelsea and Manchester City began their projects, which was before Financial Fair Play.” It’s also still not clear whether the Iranian will ultimately become the outright owner of the club. 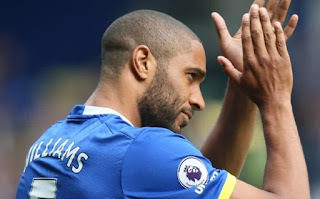 "Williams, it was really nothing"
However, at least the club now has stronger backing, whereas for the past few years Everton have struggled to compete due to a lack of financial resources. In the shape of Moshiri, they evidently have a man with a plan, including reduction of external debt, increased commercial income and, of course, a new stadium.